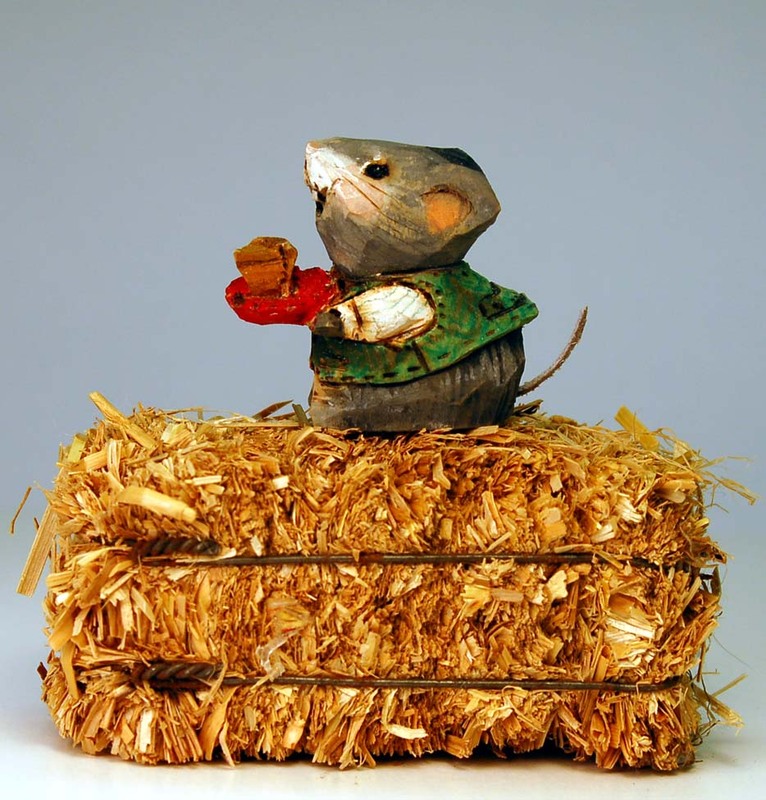 The little hay bale, 3" x1"x 1/2" purchased at a craft store can give you an idea of size, and also a cute idea for what to do with a seasonal pin when it's not being worn! He and the black cat magnet, below, make a cute team, another display idea. 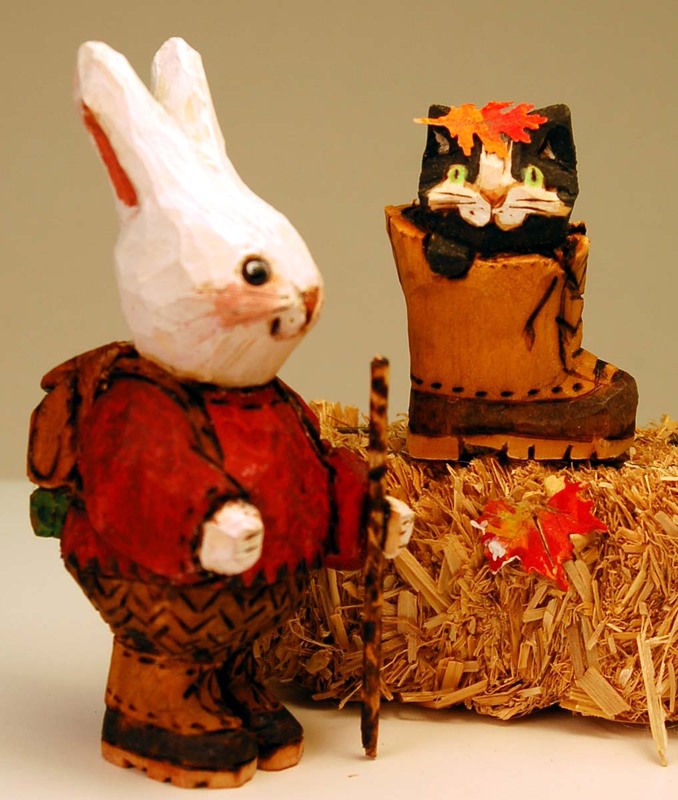 This perky cat in boot pin, shown displayed on a miniature hay bale, is a flexible design because it is suitable for Fall or Halloween. It was so popular I now also offer it in magnet size. It can come with or without the leaf. Without the leaf it is suitably cute for Fall, Winter and all the way through mud season in the Spring. 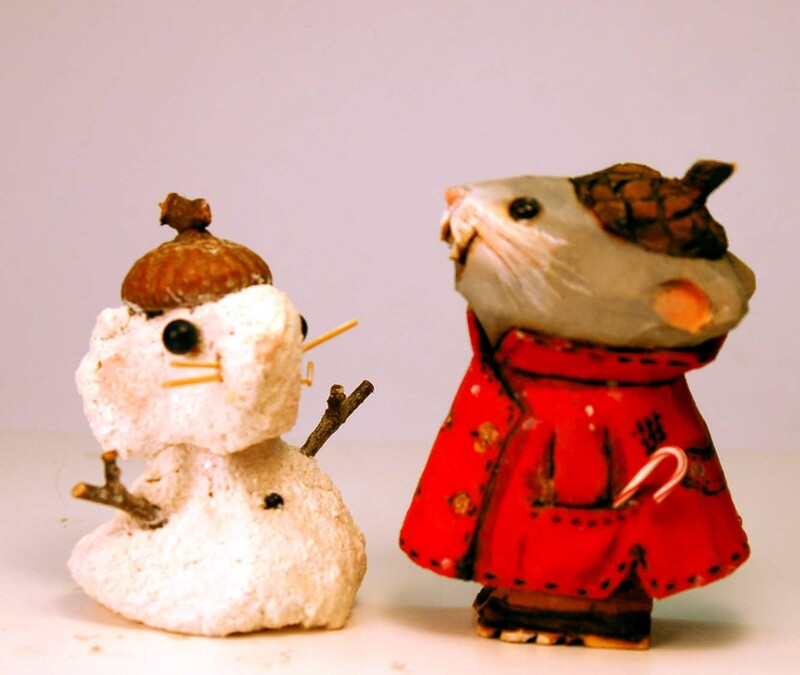 Not a holiday carving by itself, but when paired with mice pins from any of the holidays it make a cute display. Shown here eyeing the pumpkin pie, or perhaps the mouse holding it. Magnets come with a free little metal hanging strip so they can also hang as ornaments. 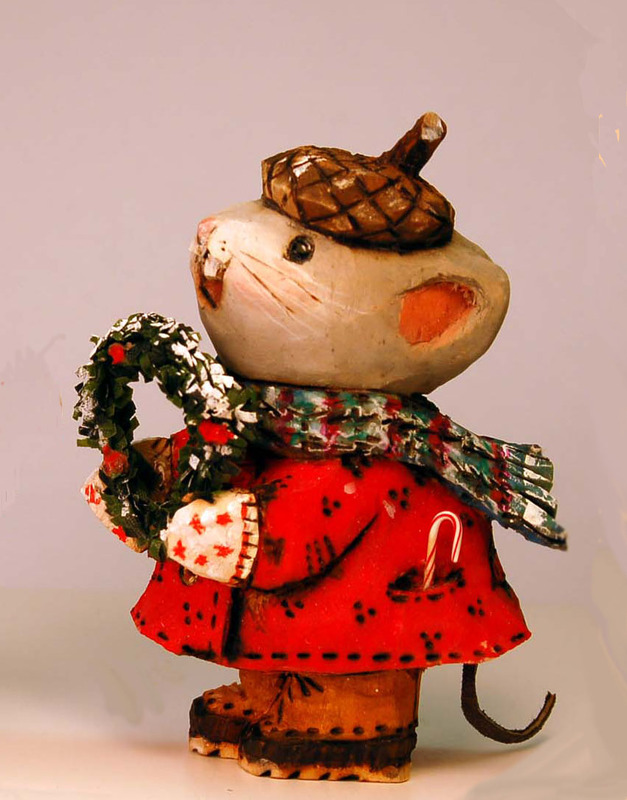 This small series of Sculpture-Magnets began when designing a Wreath Holding Mouse for the express purpose of use in a photograph on the publicity posters for the Old Deerfield Christmas Sampler show in 2007. 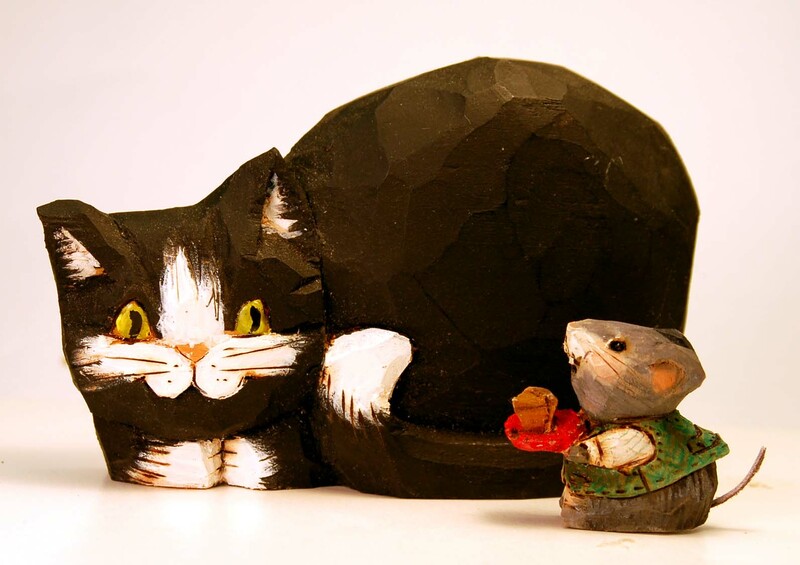 Photography can only see a sculpture from one side, so, to get the maximum cuteness for a photo the format of a magnet works best. Designing a magnet is much like drawing, there is one viewpoint and all the lines and details are planned for best effect to give the illusion of being three-dimensional. Then the design/drawing is then further enhanced by adding the depth of the carving. I started adding things, the wreath, the candy canes in pockets, that took these beyond what is normally considered a magnet. Thus the "Sculpture-magnet" designation. 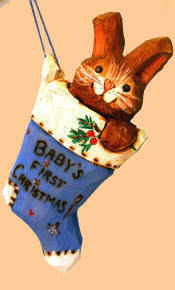 Displayed on a narrow shelf, window sill, or framed (see Magnets for how to do this) this format is most effective. 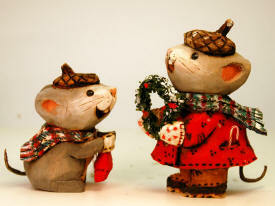 A Tartan Scarf mouse magnet with Wreath Sculpture-magnet shows difference between the two types of magnet. Keeping the ideas that defined this group, I began exploring ways to make them less expensive. 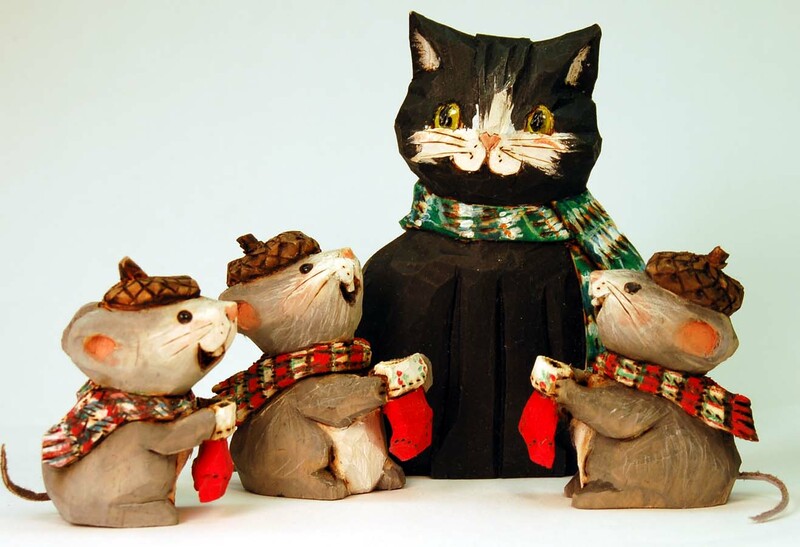 The scarves are one of the things that take a lot of time. I wondered if I could come up with a jacket design that would look equally "wintry" and have as much visual punch and signature detail as the scarves. I think I was successful. 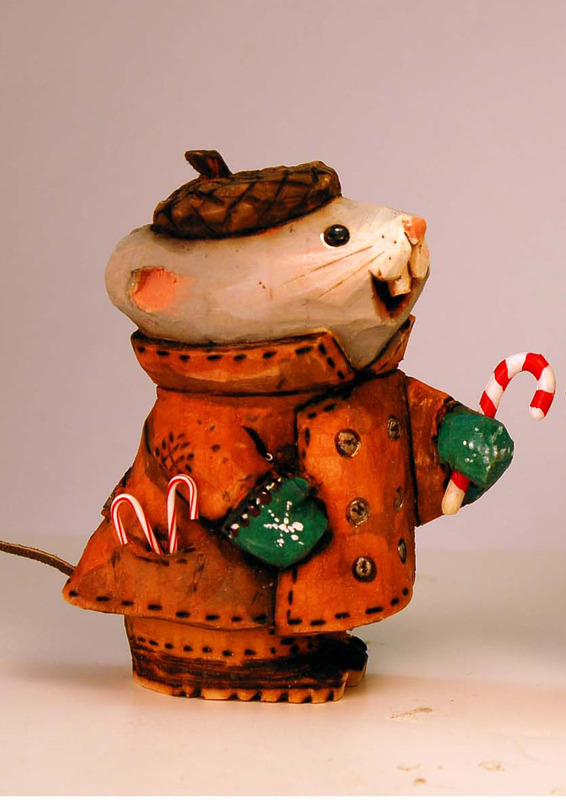 This new winter jacket design is destined to be the basis of a new group of Winter Tan Jacket Mice (but hopefully I'll think of a better title!). These cheery little Christmas mice have carved acorn hats and hold stockings ready for personalizing. Meet "Toothy" and "Lumpy". Two little goofballs. I think Toothy forgot to wear his retainer and Lumpy the snowman has an abnormally skinny neck. Nevertheless they got together, and have become friends. Must go together and selling at a two for one price. Toothy is magnet backed so can stand, or be an ornament. Lumpy is paper Mache and can stand or be an ornament. 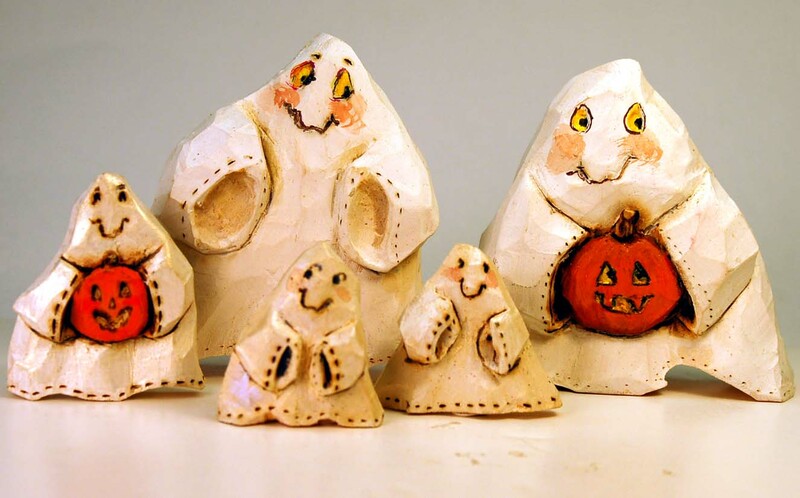 Additional carvings and additional holiday categories are coming soon to this section. 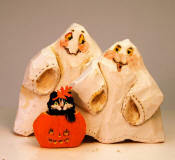 2-1/2" to 4" tall these freestanding Ghost Magnets come your way plain or carrying jack-o-lanterns. 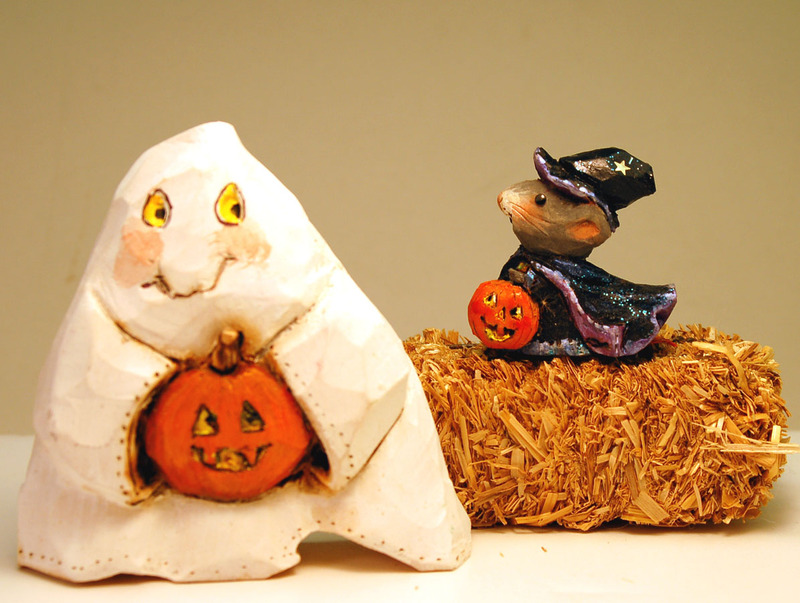 They make a great foundation for creating unique Halloween displays that are sure to bring a smile. A few left, email for photos. This little Witch Pin is quite elaborate with attention to every detail. She is 1 1/2" tall. Only one for 2008. The purple lined flowing cape and her peaked hat sparkle with iridescent blue. There is a little sparkling star on the side of her hat. 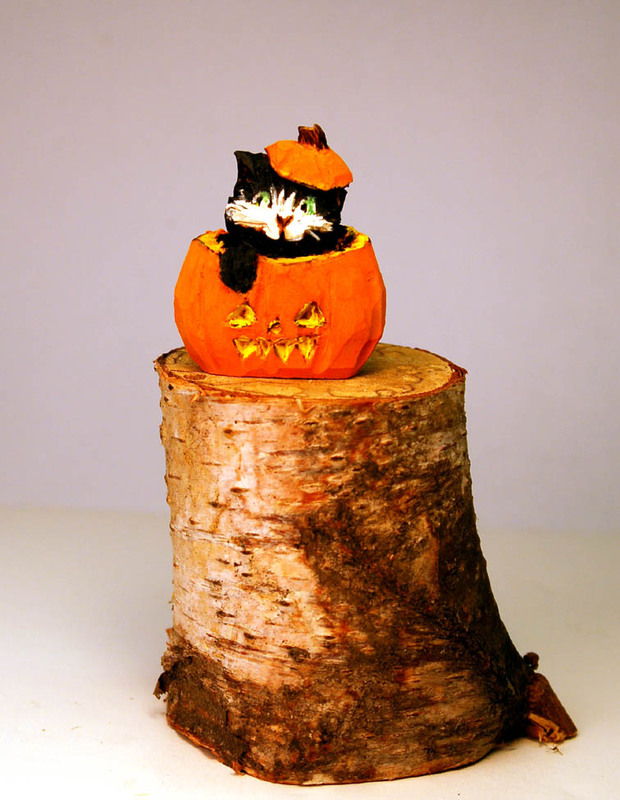 The pumpkin she holds by the stem is absolutely perfect. A new design. Also available a mouse in a Jack-o-Lantern pin. Email for pictures of all available. 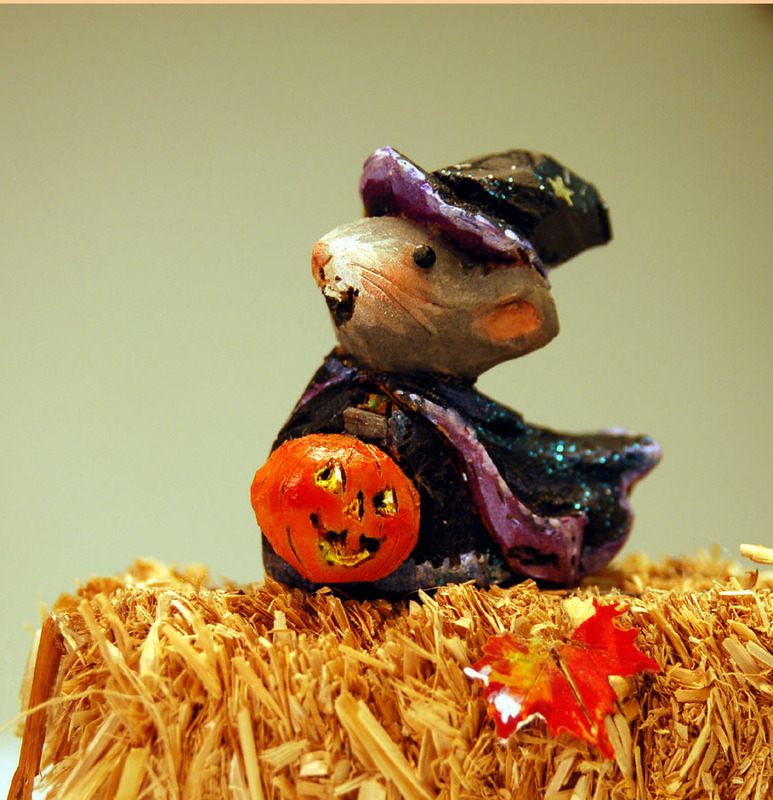 Halloween pins are freestanding and can include a little stump for use as display piece. Pin is just under 1 1/2" tall.